You can now get all the information about how people arrive at your site. 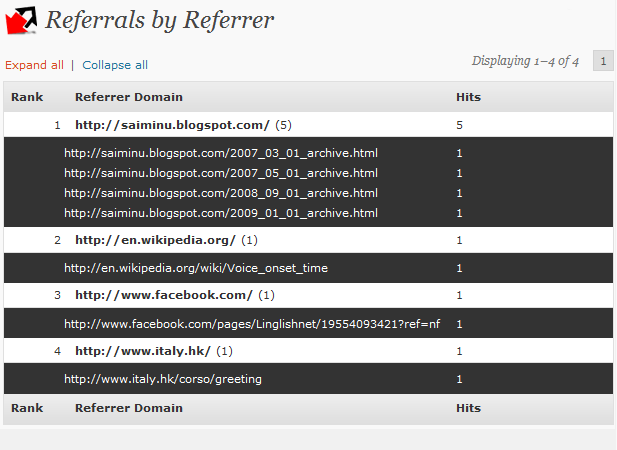 WP-Referrers tracks all the referrals leading to your site, organize and neatly present them in a number of ways. To start with, you can check out the lastest referrers to your site. You can view the referrers by the referrer URL or by the local page referred to. In addition, WP-Referrers also recognizes referrals from major search engines. 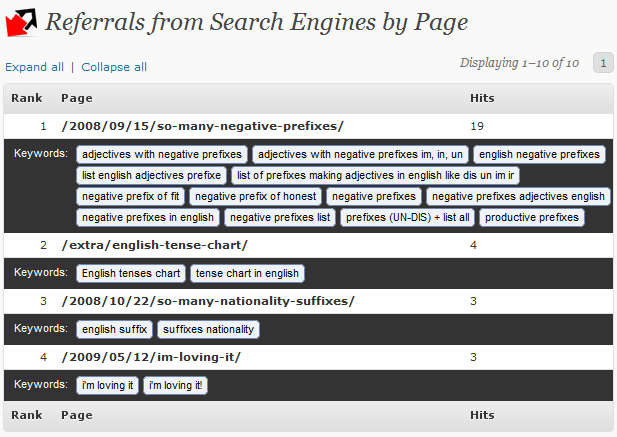 You can see how many hits you get from each search engine, and what keywords people use to get to your site. Done. WP_Referrers will take care of the rest. Nice plugin, but there is a litte bug. The table prefix is not used when the tables are created in the mysql database. My hosting provider gives me only one DB I share between two blogs, and I use this prefix to split the db. I’d appreciate if you fix this issue in the next release. Bug fixed. Thank you for your report. It seems to be working now ! i have a small question i have just started to use your plugin and i have noticed i am getting referals show up for other wordpress users via there admin panels could you relate on this for me as im baffled. There is a small bug in the latest release of WP-referrers, when viewing “Referrals from Search Engines by Page” links in the navbar are not corrects. Although the plugin seems to be working, it has no recordings under “by search engine” and “by keywords” tabs. The others seem to work fine, it shows all the referrers (including tons of Google visitors) and the pages. But somehow I have no records available under “by search engine” and “by keywords” tabs. Hi, I’m having the same problem, I get no records yet for: by page from SE, by Search Engine, and by keyword. The other reports are fine. Do you have a fix? Hi Thomas – i wanted to ask your guidance about the specific usage of the plugin but didn’t see a way to contact you other than a comment field. Could you please reply to the email in this post? Thank you. i really like this plugin would it be possible to add a widget for it? so display (verified?/(checked?) the related refferers on each page? There is a major flaw in your plugin. As admin you are able to see the Refferes mini-dashboard drop down with all the featured areas. However, OTHER registered users that are on the site have access & can see & utilize the same; such as Subscribers, Editors, Authors & Contributors. The only individual that should be allowed to access this area should be the Admins. This is a major flaw with this plugin, whereas, a regular subscriber who is registered on your site & has a profile will have access to the Referrers section & all the date within it. Can you take a look at this issue & get it fixed? Many thanks in advance to help me. Thx for your job. How can i use referrers in page template. Just simple echo list of the keywords. on the latest download of wordpress. I have installed the application and it look amazing except it does not catch or does not report any referred urls. can you help with information regarding known issues. It has always functioned well but since Avril 22 there is the problem that referrers are not being shown any more. There have always been quite a number of daily referrers over a long time. So it is not possible that suddenly there are no referrers any more. How can I fix the problem?